The limits of the human eye and why it’s tough for manufacturers to design TVs. Defining the ‘standard eye’ so we can get on with the show. The formula for the ideal TV viewing distance. How far forward or back can you go from the ideal viewing distance. How to put together a home theatre room experience (audio excluded). To keep you from losing your sanity, I’ve put the most technical and mathematical bits in boxes, so feel free to skip them. You can directly relate ppi (pixels per inch) to viewing distance. They are inversely proportional. There is an average eye (20/20) and an eagle eye (maximum resolution capable by the human eye, about 0.4 arc minute). Nobody gets closer than one foot, even though the average human can focus up to 4 inches. If you think you are the exception, imagine standing a foot away from a 42″ TV and suddenly a close up appears. Where will you look? Secondly, at that distance, a television also invades on a person’s private space. Finding the right TV viewing distance, then, is a matter of understanding the relationship between ppi, your eye and your distance to the TV, monitor or display. This is what we’ll focus on. Whose eye shall we use? 20/60 (or 3 arc minute) is the starting point for low vision. This is the point when you have to wear prescription glasses to get things done. The glasses get you back to 20/20 or at least 20/40 – the latter being the limit for driving. Check your country laws. 20/200 (10 arc minute) is the threshold for legal blindness. Since most television viewers will be under the 3 arc minute limit, that’s what I’ll use as the lower limit. This means, the left most limit (-4?, not shown, infinity actually) is 3 arc minute, and the right most (4?, not shown, infinity actually) is 0.4 arc minute. The middle would correspond to 1.7 arc minute (about 20/35). I want it to be 1 arc minute so bad, but life doesn’t work that way. 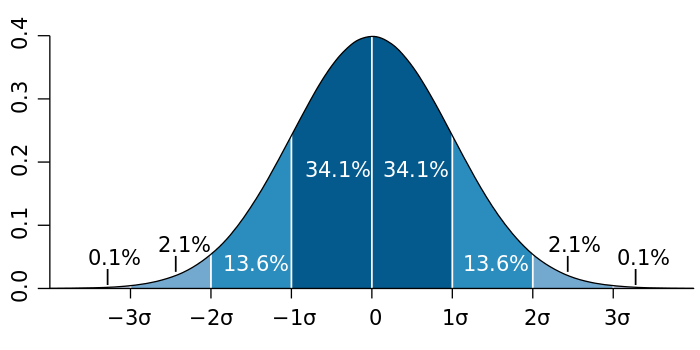 The area under the curve represents the population of the human race. 3? corresponds to 99.73% of the human race, and 2? corresponds to 95.45% of the human race. Is that additional 2.1% important? Let’s see, 2.1% of 7 billion is about 147 million! The population of the USA is about 315 million, and 2.1% would result in 6.6 million people, or 132,300 people per state. That’s not a small market for any manufacturer. Therefore, it is only reasonable to assume 3? to be the upper limit, which corresponds to about 0.7 arc minute. For the lower limit, I think you need 20/40 vision for a pleasurable TV viewing experience. That corresponds to 2 arc minute, or roughly -1?. Therefore, we have to satisfy two eyes – one with a resolution of 2 arc minute and the other with a resolution of 0.7 arc minute. Together, these two dudes represent roughly 84% of the humans on earth – whether they are in a position to buy TVs, or not. Can manufacturers satisfy both eyes? Not really, as we shall see soon. First, let’s find the formula for TV viewing distance. The bigger the TV gets, the further away you need to sit. The green line represents 20 feet from the TV, probably the longest anyone is going to sit (more later). As you can see, eagle eyes (0.7 arc minuters) reach their ‘limit’ at 20 feet when the screen is about 105″ in diagonal. Anything bigger will force them to go further away. At this same screen size, an average ‘normal’ person (2 arc minuters) must sit about 7 feet away. Can manufacturers please both groups? Look at the above graph again. If eagle eyes needs to be at 10 feet for a 55″ screen, a normal person must sit at 3.5 feet! If the normal person steps back to about 7 feet, the resolution of the TV is halved, which means, the 1920 x 1080 screen will look like 960 x 540 (Standard Definition) to them! If eagle eyes view a 42″ screen at 8 feet, the same screen demands that normal people sit at about 2.7 feet. If normal people have to go to 8 feet to sit on the same couch, they have lost thrice the resolution. If the normal person wants to sit at 6 feet, the screen has to be 95″ in diagonal. If eagle eyes sits at that distance, they will see pixels (more later). You really cannot please everyone, so manufacturers need to find one standard human resolution to which they will base their calculations on. Since each manufacturer is free to choose their own value, we can’t have a standard unified value for Earth. Even if they decided to do so, it would be a tall order to really find an average that is true. Therefore, we are left with guesstimates. To bring closure to this article, I must arrive at a figure as well, and for better or for worse, I choose 1.3 arc minutes (slightly better than 20/30) as the standard resolution of the human eye for the purposes of calculating the TV viewing distance. There is a mathematical basis for this estimate, but it is highly subjective and isn’t worth mentioning here. People don’t always watch from the ideal distance. So, there are limits to how far or close they can go. If people watch lower-rez content (like DVDs on HDTV or 1080p content on 4K?) it affects their viewing. If people watch content in other aspect ratios (like 4:2, 2.39:1, etc.) it affects their viewing. To keep things simple, I will not include this in our considerations, because manufacturers cannot design television panels for every case scenario. If you do wish to know the viewing distance for this instance, use the first formula. When is a pixel not a pixel? When we say the eye ‘resolves’ detail, we mean it can clearly and indubitably mark out that detail among everything else that surrounds it. There should be absolutely no doubt. However, we know, in the real world, there are many cases where doubt is likely to happen. You can clearly make out there are two pixels, right? What if I brought them closer enough to overlap a bit? What about a greater overlap? As you can see, the closer two pixels get to each other, the greater the chances that we start thinking of them as one thing. The eye no longer resolves one pixel clearly. Next, pixels don’t change their position, only we do. We either go closer to it, or further away from it. When we get closer, the pixel magnifies. When we get further away, the pixel becomes smaller. Let’s look a progression of pixels as they get smaller and smaller. At what point do you begin to think there is only one pixel instead of two? The point where two pixels become one to our eye is the point resolution is halved. What is so important about this point? If we know this point, we know the upper and lower limits of how far we’re supposed to sit from the ideal viewing distance. If pixels are bunched perfectly next to each other, and if they are the same dimensions all around (circle or square), we can say the limit at which we know for sure they are separate is if the total length is twice the size of the pixel (2d). However, pixels can also be blended in diagonally (middle image). In this case, the minimum distance is 2?2d (almost three times d). If we can see the gap between two pixels (i.e., if we can resolve the gap) then we’ll start to see pixels. If the size of two pixels become the size of one pixel (because we’ve gone further back), then the resolution can be said to be halved. You’ll start to see gaps when you can resolve about half a pixel (twice the ideal resolution). You’ll know for sure there are gaps when you can resolve about one-third a pixel (thrice the ideal resolution). Closer – Twice to thrice the ideal TV viewing distance. Since we are looking for the ‘ideal’ viewing distance, we can ignore the greater number (who wants to see pixels anyway?). Further away – Twice to thrice the ideal TV viewing distance. How far or close from the ideal viewing distance can we go? From the above, as a general rule of thumb, we can assume that we shouldn’t go more than twice the ideal distance, and certainly never more than thrice the ideal distance – in either direction. That’s easy to remember. To keep things simple, let’s stick to twice the ideal distance in either direction. We need to add to this a dose of practical reality. How far do people sit anyway? The seating arrangement is usually based on the size and layout of the room, rather than the ideal TV viewing distance. Kids like to sit close to the TV, maybe even at 3 feet. Adults usually sit at least 6 feet away. At this distance, four individuals can enjoy the same content. What about the other extreme? To people who watch content in a cinema or home theatre, this distance does matter. Luckily, we have one factor that helps limit the size of the screen, and that is the width of your home theatre room. A 10 feet long screen is large enough, and I seriously cannot imagine anyone going over 20 feet (30 feet at it might as well be a multiplex screen!). Therefore, I believe a home cinema might stop at a length of 15 feet. In diagonal inches, this translates to about 200″. According to THX, for an ideal viewing experience, you need to ensure the viewing angle is 40 degrees or less. 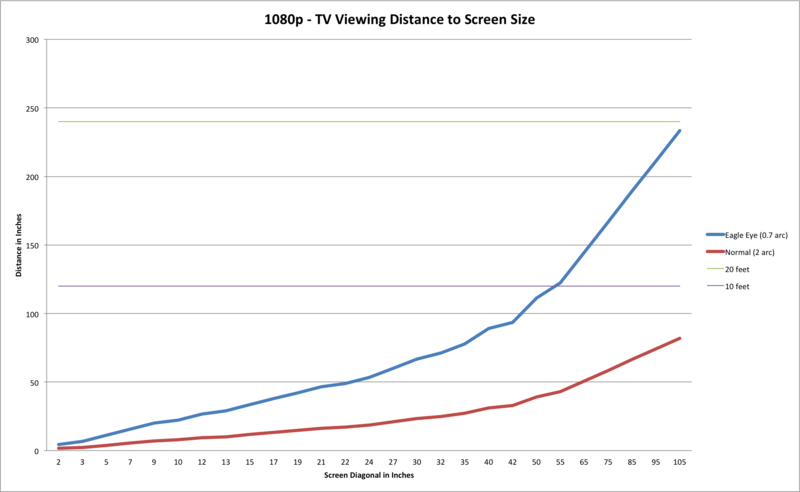 Just taking this as a guideline, and without boring you with the math, the distance from a 200″ screen is roughly 20 feet. Don’t forget, we have to consider audio and the locations of the speakers as well. Great! We know how far forward or backward we can go from the ideal position, and we know the absolute limits at which people watch TV – normally. Let’s put it all together. 1 – Below 5″, 1080p is all you need for reading at close distances (one foot or less) – current mobile phones have reached this limit already. 2 – At about 19″, we can’t go further than 3 feet away or we’ll lose resolution. Tablets and laptops fall under this zone, because they are used (read) from one to three feet. It shows that 1080p is all you need, even at one feet. Monitors greater than 19″ offer 2K and above resolutions because people like to sit close to them. 3 – After this point, you can no longer sit at three feet or you’ll risk seeing pixels. This is probably why popular HDTVs usually end at 65″. There are a few bigger screens, of course, but they demand that you sit further away than what is comfortable home viewing. 4 – At this point, you are at the limit at 20 feet, which also decides the limit of HDTV – 105″. 5 – This is the limit (at 10 feet) for a home theater viewing experience. As you can see, the ideal viewing distance at this size is about 30 feet. Any room greater than this is an auditorium! 32″ is a good starting point for HDTVs – where you can sit 6 feet away. Let’s say you want a 200″ screen. As we have seen, that means you need a wall at least 15 feet wide. Let’s assume your wall is 20 feet wide. If you’re planning a spot at the ideal location, at 30 feet, then how many people can sit ahead of or behind you? Ideally, the seat spacing (from back to back) should be about 45″. Let’s also assume you have comfy chairs and the width is 45″ as well. How many seats can you cram in horizontally into 15 feet (you need passage ways on the sides)? Four seats. The ‘money’ seat is at a distance of 30 feet. The closest seat should be at 15 feet. How many seats can you place between the two? Four seats. Because you are a rich soul, you add another row behind the ‘money’ row (because you don’t like sitting in the last row). This means your home theater can seat 20 people comfortably. The length of your home theater room is now about 40 feet. That’s big! What about the height? You need to ensure each subsequent row is a step above, usually 12″. Four seats will raise the level by about 48″ or 4 feet. Your screen is about 100″ high, or 8.5 feet. If the money row is slightly above the center of the screen, the lowest row will be slightly raising their head by 5o. That’s perfectly okay. However, this means the total height of your room is about 15 feet. The size of your splendid home theater is 20 feet wide x 40 feet long x 15 feet high. What will be a nightmare, though, is audio. Let’s close with a dose of reality. It’s easy to throw about 1080p and 4K and so on, imagining these resolutions are what you get in the real world. They’re not. Let’s say your eye can see 4K (just for the fun of it, doesn’t mean anything). 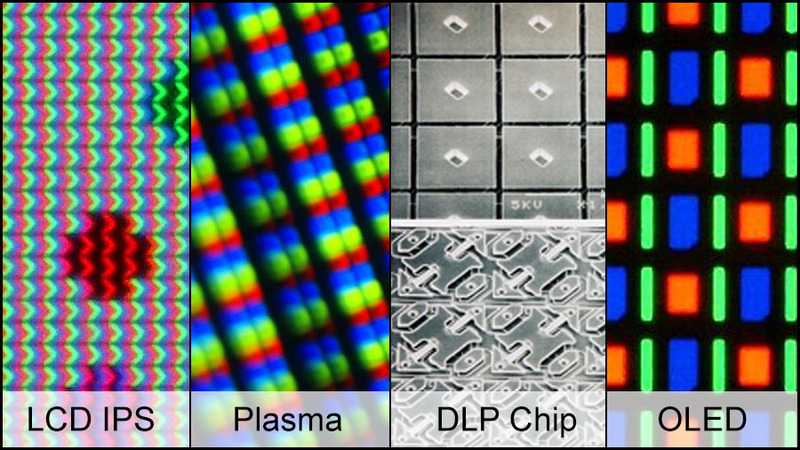 By the time the Bayer sensor in your camera captures it, the lens and in-camera filters get through with it, you lose a quarter to half the resolution, even before any processing has occurred. Now you’re left with 2K to 3K. On top of this, the camera throws away some resolution in chroma subsampling, color space conversions and compression. Depending on the severity of these processors, the resolution drops that much further. Then, in post production, curious and busy minds push the color, transcode or add filters to an already resolution-starved image. If you’re lucky, you might get a 2K image at the end of it. We’re not done. Add TV or Internet compression, which drastically reduces image resolution to about 1.5K or even 1K! And then comes the technology of the television or projector, and the viewing conditions. If there’s too much ambient light, you lose resolution. If the display isn’t very good, you lose resolution. If your viewing angle isn’t spot on, you lose resolution. If the screen plane isn’t 100% flat, you lose resolution. Who knows? 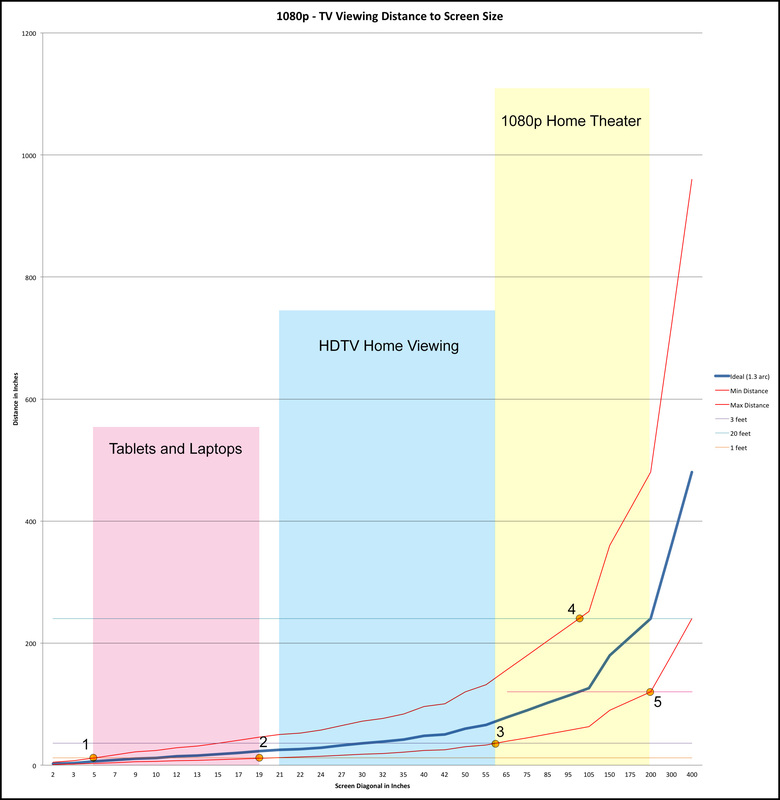 What we’re seeing as 4K is probably only 1K, and what we know as 1080p or 2K is probably only standard definition. Luckily, we don’t have to change our calculations because the errors are also in the TV technologies themselves. A 4K TV is probably only a 2K TV (or worse!) in real life! Film was slightly different. It avoided the steps of compression and color space transformation. It had its own issues, but none as drastic or depressing as digital video workflows. You lost about half the resolution, which is not bad. With digital, you might be losing three-fourths of it – that’s horrific. Hey, all is not bad. We still enjoy good movies – hopefully now at the ideal viewing distance!